Everywhere at Once: There are endless reasons we all fall for the mountains, but one enchants us above all others: This place feels like home in our hearts. Here, five writers share how their deep connections to these hills were forged with Sunday drives, old-time music, wildflower hikes, and through the discovery of inspiration and strength. Where I live, I gaze out a very large window onto a small lake that attracts blue herons. These ancient birds are my neighbors, their stick-like legs and sky-carving calls as they prepare to alight on the shore are every bit a part of my geography as the bowl of trees enclosing us. 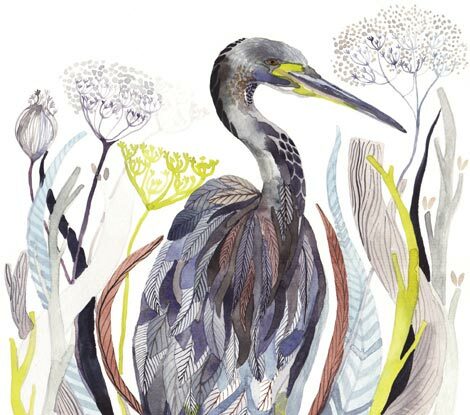 I grew up in the blue heron’s migration path, from the Canadian North Woods to Asheville to Siesta Key, Florida. In each place, at some time of year, the herons were near. As a child, I had the honor of rescuing a small one that had somehow wandered from the mangroves of our island to the street. I held the young bird in my hands and carried its early body back into the shoal and mangrove darkness, then I quickly disappeared. I have moved to Asheville four times in my life. The first was with my family in 1978, only to leave two years later with sadness in our hearts. I spent my teen and college years by the sea in Sarasota then returned to Asheville with my mother. A few months later, I left for Australia. As my time there came to a close, I stood before a wall of brochures in a travel office in Melbourne trying to choose my next destination. The names of the places were hidden, with only bold photographs visible. My eyes scanned them all: St. Basil’s in Moscow, the Alps, the green fields of Vietnam. There was one photograph I could not look away from. The one that spoke most deeply to me featured soft, dark mountains with clouds weaving between. “That’s the place,” I said to myself and reached to discover the name of my next destination: the Great Smoky Mountains. Asheville. Home. When I bought my house here, I decided this was going to be it. But even given my multiple returns to the region, I didn’t feel entirely at home in Western North Carolina until after I had written nearly a hundred poems to the mountains. Each one offered a deeper engagement with the forms and light that make this place unique: its perpetual twilight, the mangled rhododendron hells, the lichen-bound birches. All that I had been surrounded with worked its way into the metaphors that were at once about the mountains and myself. Waken deep in their folds. Have bound ourselves to the old. The poems were my offerings to the land, to the wilderness. They were my own tangling with the earth. The question of what calls us to a place, and back to a place, continued to stir me. I discovered there is a bioregional similarity between the Southern Appalachians and my native Southern Ontario, Canada. This idea appealed to me and my body; though, the geography had changed, the conifers and wildlife had not. I learned a while later that our mountains tie us to not only Maine, but also once connected Africa, Iceland, and parts of Europe. The land the mountains unified was called Pangaea. To the oldest part of the soul’s memory, living here is living everywhere. It connects us mountain dwellers to a deep, unified truth of humanity. I have migrated like the herons, and, like the herons that stalk the small lake’s marsh, I have returned. It is the only place I have found that is everywhere at once to me. I feel the mountains pulse and age. I grow old with them and renew. Laura Hope-Gill is the outreach coordinator and an associate professor at Lenoir-Rhyne University Center for Graduate Studies in Asheville. She is the founding director of Asheville Wordfest, a N.C. Arts Fellow in creative nonfiction, and the first poet laureate of the Blue Ridge Parkway. Her books include The Soul Tree and Look Up Asheville I and II: an Architectural Journey.